Wilderness therapy programs, also known as “wilderness camps” or “outdoor education,” can be highly effective in treating teens struggling with behavioral problems like video game addiction or obsessive internet use. First and foremost, you remove the tools for these addictions by placing them in a pristine wilderness environment, allowing the child to focus on the underlying reasons they have become compulsive game players. Many of these teens have never experienced one-on-one time with nature. Many of them have been locked in their bedrooms where they play games long into the night. In wilderness programs, teens develop not only an appreciation for the solitude and power of nature, a profound metaphor for the life: it offers much more than what you see on your Xbox “world” or computer monitor. This therapeutic, “back to basics” approach helps teens shed their destructive learned behaviors and start fresh. Sometimes gaming gives teens a false sense of control. If they play long enough, they can become a wizard or an expert sniper. In the wilderness, they learn real-world skills. One of the earliest lessons in the wilderness is that some things can be controlled, while others cannot. Teens learn they can control their own behaviors and responses, but they cannot change camp rules or control the environment, weather, or other campers. The wilderness becomes the perfect teacher – a teacher who does not bend rules, make exceptions, or accept excuses. In the wilderness, cooperation and communication are essential for students who wish to stay comfortable. If campers don’t want to get rained on, they must set up their tarps; if they want to eat a warm meal, they must learn to start a fire. Through the wilderness experience, students learn the value of teamwork, begin to lean on each other, and foster meaningful relationships with other teens – often for the first time in their lives. Living in nature can be a challenging and humbling experience. Under the direction and guidance of expert field leaders trained in cognitive behavioral therapy, teens become strong enough, physically and mentally, to tackle these challenges. As teens begin to learn real-life skills such as survival, self-care, coping mechanisms, and personal responsibility, they develop a profound sense of confidence. After students learn a new real-world task or skill, wilderness guides sit down and discuss how those lessons can be generalized to life at home. Guides go through the experience with the teen, providing structure and boundaries along the way while showing students the immediate consequences of their actions. By rising to the wilderness challenge, teens discover they are capable of thriving in any environment, even without the comforts of home. When the computers, televisions, video games, and other distractions are removed, teens are left with vast open spaces and the stillness of nature to reflect on their lives, their mistakes, and their relationships at home. They learn to appreciate the simple things – water, food, a warm place to sleep, and eventually friends and family. For teens who have isolated themselves in a virtual world, this reconnection with other human beings is a critical part of the wilderness therapy experience. 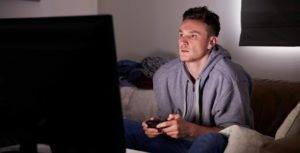 A few wilderness programs are specially equipped to address the psychological and emotional issues behind video gaming addiction. Aspen Achievement Academy in Utah, a wilderness program once featured on British TV’s Brat Camp, focuses on this issue in a way that helps teens recognize the reasons they escape to virtual worlds. SUWS Youth & Adolescent in Idaho also specializes in such obsessive behaviors. SUWS is the longest running wilderness therapy program for children ages 11 to 17. Wilderness therapy is a powerful experience for an adolescent. By the end of an outdoor program, teens develop a strong sense of accomplishment and personal growth and are well-equipped to move onto the next stage of their journey.